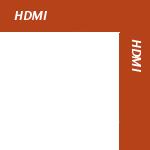 The Cardas HDMI meets the 1.4 standard. It is a symmetrical design using ultra pure silver-plated 24 AWG copper conductors. It has nitrogen gas injected dielectric and is shielded by two layers of aluminum foil plus a layer of braided copper shielding. The connectors are gold plated. It has a bandwidth of 340 MHz.